A Taste Of Yellow is a blog event started by the brave and beautiful Barbara of Winos And Foodies. It’s an event she created to support LiveSTRONG Day and raise cancer awareness. Barbara has been hosting this event since 2007 and it gets such wonderful and encouraging response every year. Almost all lives today have been touch by cancer one way or the other and a Taste Of Yellow gives us a chance to lend a hand in a way that we, as food bloggers, love…through food. Yellow food to be exact. Sunny, bright, hopeful, yellow food! This year she adds a new theme. She asks us to incorporate a heart into entry, which I think is a fantastic idea! After all, the warm comforting blanket of love can sometimes be the best medicine of all. For this round I decided to try a recipe that had been sitting in my to-bake files for ages. The Magnolia Bakery Vanilla Cupcakes. I love the sunshiney personality of vanilla cupcakes, despite being a chocolate person, and can never have enough of them. – Line two 12 cup muffin tins with cupcake papers. – Cream butter at medium speed in large bowl. – Add sugar gradually and beat until fluffy. Then add eggs. – Combine flours. Add to butter mixture in four parts, alternating with the milk and vanilla extract. – Spoon the batter into cups so they are ¾ full. – Place butter, milk, vanilla extract and 4 cups of sugar in a large mixing bowl and beat until smooth and creamy. – Gradually add the remaining sugar, once cup at a time until thick. – Add a few drops of food coloring if desired and mix thoroughly. I love Magnolia Bakery vanilla cupcakes and yours look magnificent! Looks easy to make. I might put the recipe on the to do list. Thanks. These are bright and sunny indeed! I love the thick icing. They look beautiful Joey. Thank you for sharing your heart for LiveSTRONG Day. Great pics as always. Nicely done. Thanks Rosa! I’ve never even tried the originals! Hi Peachkins! They are quite good! Hi Midge! Truly! Just the aroma of vanilla makes me feel warm and snuggly! Hi Mom-Friday! I have heard so much about it too but have never been…will just have to be satisfied with these for now! Hi Candishhh! Thanks! Every time I baked cupcakes I wonder what took me so long…they are such a joy to make…and eat! Hi Barbara! Glad you like it! Thank you for hosting this wonderful event! Hi Gattina! Thank you! I miss my regular blog events but there is just so much happening right now! Hi Anh! Really?? Glad to hear that you like the recipe too! You must go and try the Magnolia Bakery!! However, I have found that the recipes for their cupcakes taste better than the cupcakes at the bakery!! The brownies there are delicious though! Oh. My. God. ChichaJo, YOU just answered my prayers for a new cupcake recipe to try. And you're post is truly inspiring! HOW can I not try making THAT?!? It will be my attempt #2 at cupcake making! Wish me luck! I love your blog btw!!! Hi DW! Thank you for stopping by and leaving such a nice comment 🙂 Good luck with the cupcakes and hope you like them! 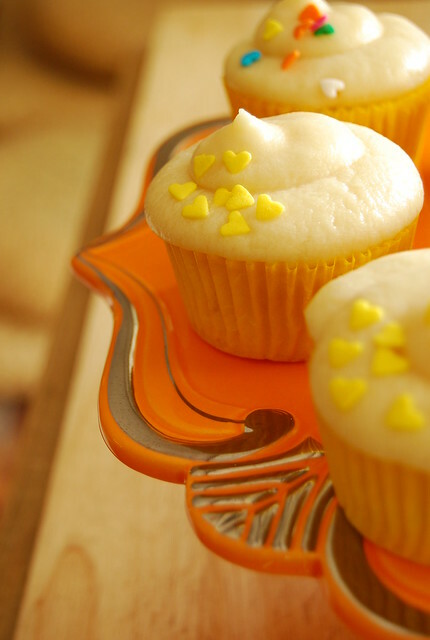 What gorgeous yellow cupcakes! Beautiful! They look yummy. I`m gonna try this recipe. I love your blog. LOOOOOOOVE your cupcakes!!!!! simple but at their very best!!!! Wish Mauritius sold pretty decorations like yours! Hi Stella! I am so happy I discovered this baking supplies store…what a wonderland! Thank you for sharing the Magnolia Vanilla Cupcake Recipe. I have always wanted to try it out, and now I will! Hi! Your blog is great, I make it a point to visit and peruse through your wonderful pictures! In terms of your buttercream icing, most people will suggest to add more powdered sugar if it's too runny or doesn't hold well- also, given the humidity of the Philippines, it is probably best to keep the frosting in the fridge (before piping and after). Hi Me Love Food! You are definitely right about the humidity here…chilling the frosting does work!